As has long been the case, American values differ from those of Western Europeans in many important ways. Most notably, Americans are more individualistic and are less supportive of a strong safety net than are the publics of Britain, France, Germany and Spain. Americans are also considerably more religious than Western Europeans, and are more socially conservative with respect to homosexuality. Americans are somewhat more inclined than Western Europeans to say that it is sometimes necessary to use military force to maintain order in the world. Moreover, Americans more often than their Western European allies believe that obtaining UN approval before their country uses military force would make it too difficult to deal with an international threat. And Americans are less inclined than the Western Europeans, with the exception of the French, to help other nations. These differences between Americans and Western Europeans echo findings from previous surveys conducted by the Pew Research Center. However, the current polling shows the American public is coming closer to Europeans in not seeing their culture as superior to that of other nations. Today, only about half of Americans believe their culture is superior to others, compared with six-in-ten in 2002. And the polling finds younger Americans less apt than their elders to hold American exceptionalist attitudes. These are among the findings from a survey by the Pew Research Center’s Global Attitudes Project, conducted in the U.S., Britain, France, Germany and Spain from March 21 to April 14 as part of the broader 23-nation poll in spring 2011. 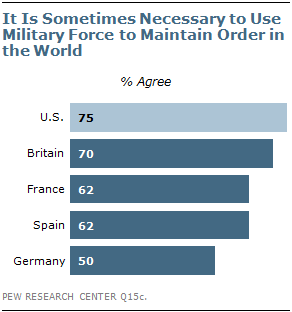 Three-quarters of Americans agree that it is sometimes necessary to use military force to maintain order in the world; this view is shared by seven-in-ten in Britain and narrower majorities in France and Spain (62% each). Germans are evenly divided, with half saying the use of force is sometimes necessary and half saying it is not. Germans are more supportive of the use of military force than they have been in recent years. For example, in 2007, just about four-in-ten (41%) Germans agreed that it was sometimes necessary, while 58% disagreed. Opinions have been more stable in the U.S., Britain and France. For the most part, opinions about the use of force do not vary considerably across demographic groups. 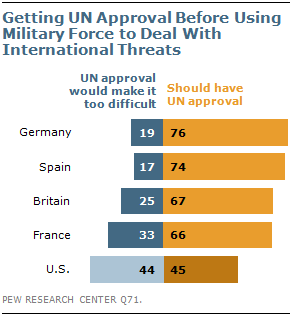 In Germany and Spain, however, support for the use of military force is far more widespread among men than among women. Six-in-ten German men agree that it is sometimes necessary to use military force to maintain order in the world, compared with just 40% of women. And while majorities across gender groups in Spain believe the use of force may be necessary, more Spanish men than Spanish women say this is the case (68% vs. 56%). When asked whether their country should have UN approval before using military force to deal with international threats, American opinion differs considerably from that of Western Europeans. Americans are almost evenly divided on the question, with 45% saying that the U.S. should have UN approval while 44% say this would make it too difficult to deal with threats; in contrast, solid majorities in the four Western European nations surveyed, including about three-quarters in Spain (74%) and Germany (76%) say their country should have UN approval before it takes military action. In Western Europe, those with a college degree are more likely than those with less education to say their country should have UN approval before using military force, although majorities across both groups share this view. For example, in Spain, 84% of those who graduated from college say UN approval should be obtained, compared with 70% of those who do not have a college degree. Double-digit differences are also evident in Britain (15 percentage points), Germany (11 points) and France (10 points). This is not the case in the U.S., where respondents across education groups offer nearly identical views. In Germany, gender differences are also notable; even though German men are more likely than women to say the use of military force is sometimes necessary, more men than women say their country should have UN approval before using force (83% vs. 70%). The view that their country should have UN approval before using military force to deal with threats is far more prevalent among American liberals than among conservatives. Close to six-in-ten (57%) liberals favor obtaining UN approval, while 33% say this would make it too difficult for the U.S. to deal with threats; in contrast, most conservatives (52%) say getting UN approval would make it too difficult to deal with threats, while 38% say this is an important step. Political moderates fall between the other two groups, with 49% saying the U.S. should seek the approval of the UN before using military force and 42% saying this would make it too difficult to deal with threats. The same ideological difference is generally not evident in Western Europe. About four-in-ten (39%) Americans say the U.S. should help other countries deal with their problems, while a narrow majority (52%) says the U.S. should deal with its own problems and let other countries deal with their problems as best they can. In this regard, Americans are not drastically different from respondents in France, where 43% believe their country should help other countries and 57% say it should focus on its own problems. The British are nearly evenly divided; 45% say their country should help other countries deal with their problems and about the same number (48%) believe Britain should deal with its own problems. 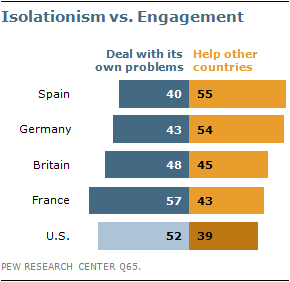 Compared with the U.S., France and Britain, Spain and Germany stand out as the only countries where majorities favor international engagement: 55% and 54%, respectively, say their countries should provide assistance to others, while 40% in Spain and 43% in Germany take the more isolationist view. Opinions about international engagement have changed somewhat in the U.S., France and Spain since last year, but while publics in the two Western European countries are now more in favor of helping others than they were in 2010, more Americans currently take an isolationist position. Last year, about the same number of Americans said their country should help other countries (45%) as said it should let other countries deal with their own problems (46%). Similarly, the Spanish were nearly evenly divided, with 49% favoring engagement and 47% taking an isolationist approach. In France, where a majority continues to take an isolationist view, even more (65%) did so a year ago. In the U.S. as well as in the four Western European countries surveyed, those with a college degree are far more likely than those with less education to offer an internationalist view. This is especially the case in Germany, where about three-quarters (73%) of those who graduated from college believe their country should help other countries deal with their problems, compared with a narrow majority (52%) of those without a college degree. Political ideology is also a factor in Germany, France and Spain. In these three countries, those on the right are more likely than those on the left to take the isolationist view when it comes to international engagement. For example, while about half (48%) of left-wing French say their country should deal with its own problems and let other countries deal with theirs as best they can, about six-in-ten (59%) on the right offer this opinion. About half of Americans (49%) and Germans (47%) agree with the statement, “Our people are not perfect, but our culture is superior to others;” 44% in Spain share this view. In Britain and France, only about a third or fewer (32% and 27%, respectively) think their culture is better than others. While opinions about cultural superiority have remained relatively stable over the years in the four Western European countries surveyed, Americans are now far less likely to say that their culture is better than others; six-in-ten Americans held this belief in 2002 and 55% did so in 2007. Belief in cultural superiority has declined among Americans across age, gender and education groups. As in past surveys, older Americans remain far more inclined than younger ones to believe that their culture is better than others. Six-in-ten Americans ages 50 or older share this view, while 34% disagree; those younger than 30 hold the opposite view, with just 37% saying American culture is superior and 61% saying it is not. Opinions are more divided among those ages 30 to 49; 44% in this group see American culture as superior and 50% do not. Similar age gaps are not as common in the Western European countries surveyed, with the exception of Spain, where majorities of older respondents, but not among younger ones, also think their culture is better than others; 55% of those ages 50 or older say this is the case, compared with 34% of those ages 30 to 49 and 39% of those younger than 30. As is the case on other measures, opinions about cultural superiority vary considerably by educational attainment. In the four Western European countries and in the U.S., those who did not graduate from college are more likely than those who did to agree that their culture is superior, even if their people are not perfect. For example, Germans with less education are about twice as likely as those with a college degree to believe their culture is superior (49% vs. 25%); double-digit differences are also present in France (20 percentage points), Spain (18 points) and Britain (11 points), while a less pronounced gap is evident in the U.S. (9 points). Finally, among Americans and Germans, political conservative are especially likely to believe their culture is superior to others. In the U.S., 63% of conservatives take this view, compared with 45% of moderates and just 34% of liberals. Similarly, a majority (54%) of right-wing Germans see their culture as superior, while 47% of moderates and 33% of those on the political left agree. American opinions continue to differ considerably from those of Western Europeans when it comes to views of individualism and the role of the state. Nearly six-in-ten (58%) Americans believe it is more important for everyone to be free to pursue their life’s goals without interference from the state, while just 35% say it is more important for the state to play an active role in society so as to guarantee that nobody is in need. In contrast, at least six-in-ten in Spain (67%), France (64%) and Germany (62%) and 55% in Britain say the state should ensure that nobody is in need; about four-in-ten or fewer consider being free from state interference a higher priority. In the U.S., Britain, France and Germany, views of the role of the state divide significantly across ideological lines. For example, three-quarters of American conservatives say individuals should be free to pursue their goals without interference from the state, while 21% say it is more important for the state to guarantee that nobody is in need; among liberals in the U.S., half would like the state to play an active role to help the needy, while 42% prefer a more limited role for the state. Those on the political right in Britain, France and Germany are also more likely than those on the left in these countries to prioritize freedom to pursue one’s goals without state interference. Unlike in the U.S., however, majorities of those on the right in France (57%) and Germany (56%) favor an active role for the state, as do more than four-in-ten (45%) conservatives in Britain. American opinions about the role of the state also vary considerably across age groups. 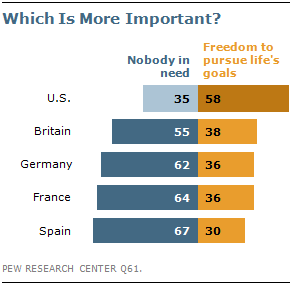 About half (47%) of those younger than 30 prioritize the freedom to pursue life’s goals without interference from the state and a similar percentage (46%) say it is more important for the state to ensure that nobody is in need; among older Americans, however, about six-in-ten consider being free a higher priority, with just about three-in-ten saying the state should play an active role so that nobody is in need. No such age difference is evident in the four Western European countries surveyed. Asked if they agree that “success in life is pretty much determined by forces outside our control,” Americans again offer more individualistic views than those expressed by Western Europeans. Only 36% of Americans believe they have little control over their fate, compared with 50% in Spain, 57% in France and 72% in Germany; Britain is the only Western European country surveyed where fewer than half (41%) share this view. In the U.S. and in Western Europe, those without a college degree are less individualistic than those who have graduated from college; this is especially the case in the U.S. and Germany. 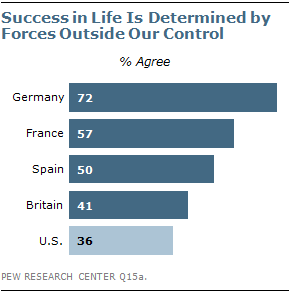 About three-quarters (74%) of Germans in the less educated group believe that success in life is largely determined by forces beyond one’s control, compared with 55% of college graduates. Among Americans, 41% of those without a college degree say they have little control over their fate, while just 22% of college graduates share this view. Americans also distinguish themselves from Western Europeans on views about the importance of religion. 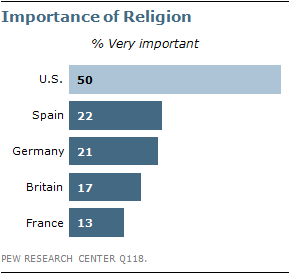 Half of Americans deem religion very important in their lives; fewer than a quarter in Spain (22%), Germany (21%), Britain (17%) and France (13%) share this view. 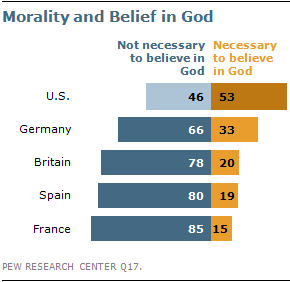 Moreover, Americans are far more inclined than Western Europeans to say it is necessary to believe in God in order to be moral and have good values; 53% say this is the case in the U.S., compared with just one-third in Germany, 20% in Britain, 19% in Spain and 15% in France. In the U.S., women and older respondents place more importance on religion and are more likely than men and younger people to say that faith in God is a necessary foundation for morality and good values. About six-in-ten (59%) American women say religion is very important in their lives, compared with 41% of men; and while a majority (56%) of Americans ages 50 and older say religion is very important to them, 48% of those ages 30 to 49 and 41% of those younger than 30 place similar importance on religion. Similarly, while a majority of American women (58%) say it is necessary to believe in God in order to be moral and have good values, men are nearly evenly divided, with 47% saying belief in God is a necessary foundation for morality and 51% saying it is not. Among Americans ages 50 and older, 58% say one must believe in God in order to be moral and have good values; 50% of those ages 30 to 49 and 46% of those younger than 30 share this view. Education also plays a role in views of religion in the U.S., to some extent. 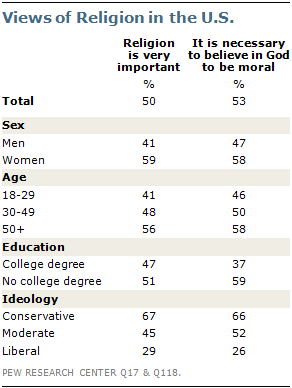 Although Americans with a college degree are about as likely as those without to say religion is very important to them (47% and 51%, respectively), the less educated are far more inclined to say that one must believe in God in order to be moral; 59% of those without a college degree say this, compared with 37% of those who have graduated from college. Views of religion and whether belief in God is a necessary foundation for morality vary little, if at all, across demographic groups in the Western European countries surveyed. In Spain, however, respondents ages 50 and older place more importance on religion than do younger people, although relatively few in this age group say it is very important to them; 33% say this is the case, compared with 16% of those ages 30 to 49 and 11% of those younger than 30. Politically, conservatives in the U.S., Spain and Germany are more likely than liberals to say it is necessary to believe in God in order to be moral and have good values, but while solid majorities of conservatives in the U.S. (66%) take this position, fewer than half of conservatives in Spain (31%) and Germany (46%) share this view. Meanwhile, just 26% of liberals in the U.S., 11% in Spain and 19% in Germany say belief in God is a necessary foundation for morality. Conservatives in the U.S. are also far more likely than liberals to consider religion very important in their lives (67% vs. 29%); in Western Europe, few across ideological groups place high importance on religion. 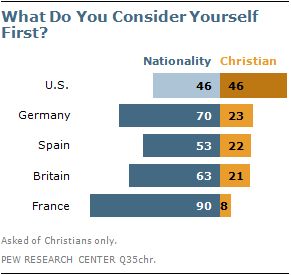 American Christians are more likely than their Western European counterparts to think of themselves first in terms of their religion rather than their nationality; 46% of Christians in the U.S. see themselves primarily as Christians and the same number consider themselves Americans first. In contrast, majorities of Christians in France (90%), Germany (70%), Britain (63%) and Spain (53%) identify primarily with their nationality rather than their religion. In Britain, France and Germany, more Christians now see themselves in terms of their nationality than did so five years ago, when national identification was already widespread in these countries. This change is especially notable in Germany, where the percentage seeing themselves first as Germans is up 11 percentage points, from 59% in 2006. Among Christians in the U.S., white evangelicals are especially inclined to identify first with their faith; 70% in this group see themselves first as Christians rather than as Americans, while 22% say they are primarily American. Among other American Christians, more identify with their nationality (55%) than with their religion (38%). 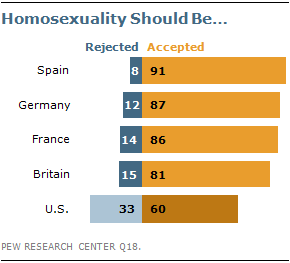 Tolerance for homosexuality is widespread in the U.S. and Western Europe, but far more Western Europeans than Americans say homosexuality should be accepted by society; at least eight-in-ten in Spain (91%), Germany (87%), France (86%) and Britain (81%), compared with 60% in the U.S. Acceptance of homosexuality has increased in recent years, and the shift is especially notable in the U.S., where only slightly more said it should be accepted (49%) than said it should be rejected (41%) in 2007. Today, more Americans accept homosexuality than reject it by a 27-percentage point margin. While there are some differences in opinions of homosexuality across demographic groups in the Western European countries surveyed, overwhelming majorities across age, education and gender groups believe homosexuality should be accepted by society. In the U.S., however, these differences are somewhat more pronounced. For example, while 67% of American women believe homosexuality should be accepted, a much narrower majority of men (54%) share that view. Among Americans with college degrees, 71% accept homosexuality, compared with 56% of those with less education. Finally, about two-thirds (68%) of Americans younger than 30 say homosexuality should be accepted by society; 61% of those ages 30 to 40 and 55% of those ages 50 and older share this view. In addition to demographic differences, an ideological divide on views of homosexuality is also notable in the U.S., where more than eight-in-ten (85%) liberals and 65% of moderates express tolerant views, compared with 44% of conservatives. In the four Western European countries surveyed, at least three-quarters across ideological groups say homosexuality should be accepted by society.